Also, the large focal light fixture in the chapel lobby has been installed, along with the ceiling grid in that area. Other light fixtures as well as grills for the HVAC are being installed, and of course the sprinklers and fire safety elements and other details. A big change will be noticeable by the weekend in the main lobby, as the ceiling tiles are being dropped into place there. The ones in the main part of the ceiling, where they are whole squares, make a big difference, of course. But those along the edges with the funny angles and the precision measurements are the ones where the quality of the workmanship shows. 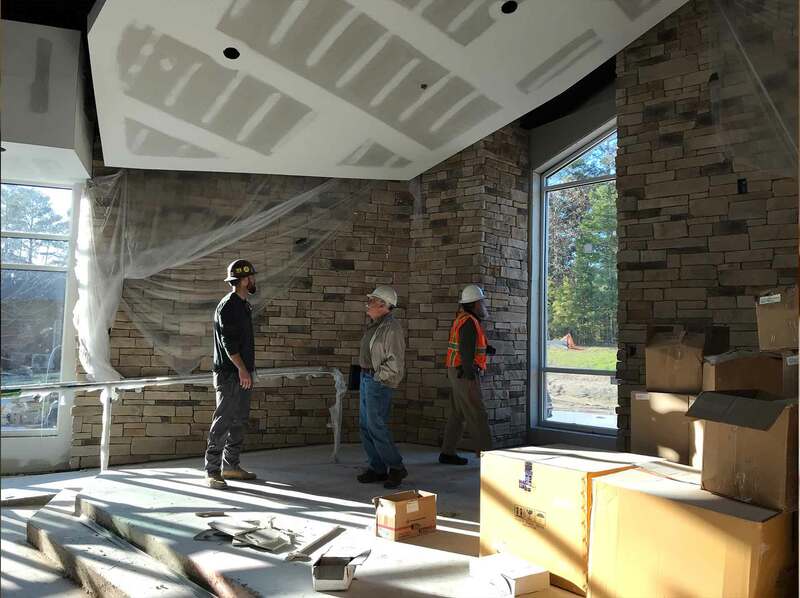 Meanwhile, many other things are happening – drywall mudding and sanding, light switches and electrical outlets, wiring for telephones and internet in the office section, slate window sills, and little punch list kinds of items are being addressed. Those of you who have been following this process know that we have been awaiting news of an official date for our certificate of occupancy: we can’t tell you yet what that date will be, but we are closer than we ever have been to being able to announce it. The chapel ceiling being started is one of the critical milestone items still to be done, so you can see that we are making progress! We hope to be able to make an announcement soon! And meanwhile, we are so very thankful for all of the key people who are working on this project on our behalf. We are thankful for RND Architects, and especially for Steve Pulling who is so careful and meticulous in his attention to the details of quality and coordination. We are thankful for CT Wilson Construction, and especially for Zak Hamlett whose daily supervision and watchfulness on our project has ensured the correctness of the work, the correct sequence of the work, and the quality of the final product. We are thankful for the many, many workers in the dozens of trades and subcontractor groups who have worked on the project. These men and women come to work every day and work together, doing tasks that are meticulous and skilled, to build by hand the space that we will soon use as a tool for ministry. We are thankful for safety on the project. Please, when you lift up your own prayers of thanksgiving this week, remember these many people before the Lord and ask his blessing on each one.